64 by 52cm., 25.5 by 20.5in. sad little ray of sunlight pierced Watts's fatherly workaholic heart.' (Veronica Franklin Gould, G. F. Watts, The Last Victorian, 2004, p.109) The little orphan Blanche had been taken with her sisters Adeline and Mary to Little Holland House, dressed in mourning black, to meet their mother Mary's aunt 'Sara' (Sarah Prinsep, neé Monckton Pattle). The three children waited nervously in the doorway of the drawing-room, awaiting their introduction and hoping that they might be adopted by their wealthy relative. As Sara considered which of the girl's she might take as her ward, Blanche suddenly rushed across the room and leaped onto the lap of the surprised Watts who had been sitting reading by the fire. At this moment he decided to adopt the delightful little girl himself with Sara taking charge of her day-to-day care. The photographer Julia Margaret Cameron (Sara's sister) adopted the other two girls but unfortunately Adelina died when she was only ten. 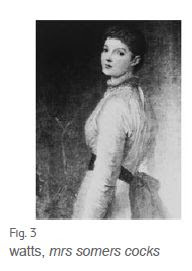 The responsibility of taking care of Blanche led Watts to write to his friend Charles Rickards; 'I have undertaken the charge of a little orphan girl so I must endeavour to do what I have not hitherto thought of doing, viz establishing a little capital.' (ibid Gould, p.109). It is likely that the portrait of Blanche dressed in a red and green dress and seated on an armchair (FIG 1. Sotheby's, New York, 25 April 2006, lot 114) was painted soon after her introduction to Watts. thirteen-years-old and it is unusual that he signed and dated it, suggesting perhaps that the picture was intended as a gift to his beloved daughter. 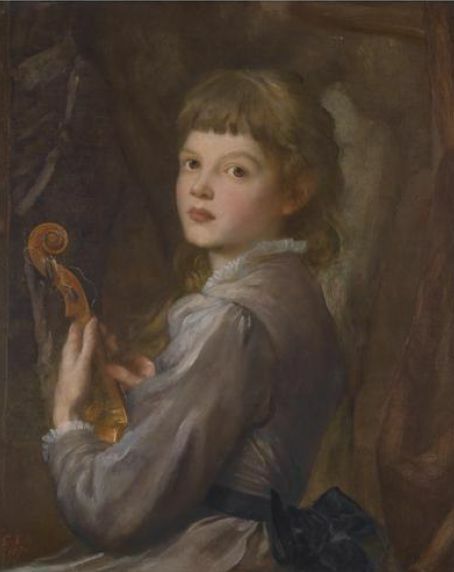 The choice to depict her holding a violin suggests the improving education that Watts and Sara Prinsep gave Blanche. To encourage her to learn to play the fiddle, Watts took lessons himself and disagreed with his friend Rickards that it would be a corrupting influence on her life. He had known Joachim (whose portrait he painted in 1865), Madame Neruda and several other female violinists who had not fallen into a life of debauchery through their music and therefore he wrote to Rickards to tell him that he thought the warning was; 'constructively defective. If not let her wear no stays, run, jump, play at cricket with her brothers if she have any and otherwise exercise her limbs and lungs. I will answer for the violin being innocent of harm to her.' The broken strings of the instrument perhaps symbolise the broken relationships of her life; the loss of her mother and father and of her older sister. violin to a pair of small girls. house The Briary in which to raise her family; she had two children Arthur and Verena. She died in 1895, nine years before Watts. Another splendid post - so informative - thanks indeed, i am so pleased that I have discovered your blog. Thank you kindly. I mainly work from old auction catalogues. I loved your post on the lovely Moll by the way. And you live in such a lovely part of the world.